Every detail of a scenario you are capturing counts. So why miss even a tiny bit? You can capture every single detail clearly if you have the right device. The Canon Vixia hf r800 is a camera that provides an advanced zoom feature. With this feature capturing the details of a scene is not any more complicated for you. But it will be smarter if you know the details about this device before you get it for yourself. In this canon Vixia hf r800 review, you can find everything you need to know about this amazing camera. By the end of this canon r800 review, I am sure you will love this camera. Canon electronics are manufacturing cameras for over 35 years and have earned themselves a lot of reputations. Not only that, they have also earned the trust of their customers by providing quality products. Founded by MR. Takeshi Mitarai along with his partners Mr. Goro Yoshida, Mr. Saburo Uchida, and Mr. Takeo Maeda Canon electronics are still now keeping their position with the top brands. You can capture videos both in slow-motion and in fast motion. The charge of the batteries will go on for longer. Transferring videos will not require an installation of any apps. External input of mic is simpler to use. In order to keep files safe, you can lock them. The camera is very light in weight to handle. Can capture the sounds distinctly and clearly. File transfer process is very slow. Touchscreen icons are very small to click or select easily. The ability of the Canon Vixia hf r800 to perform an advanced zoom on the scene is surely eye-catching. According to us, this is the most amazing feature of this device. In manual mode, you can use the advanced zoom to modify your videos. This lets you capture more detailed videos too. Also, it gives a lot of flexibility to your videos. If you are one of those videographers who like to capture scenes in details then Canon Vixia hf r800 is just the right camera for you. Because of an advanced zoom feature, videography will never be the same with this amazing camera. Impressively, it has 57X zoom, for creating videos of dynamic verities. While shooting a particular scenario, the actions of that scene will not be disrupted for such feature. You have to admit, as a videographer, that camera shaking gives you a lot of troubles while shooting, doesn’t it? Well, the Canon Vixia hf r800 has a sophisticated optical image stabilizer with a Super-Range option. Containing such technology makes the video shaking go away with just a snap of a finger. Even if you are shooting at a longer range, the details and the sharpness will be very steady with this awesome device. Moreover, you can get the benefits of an FHD CMOS sensor with the Canon Vixia hf r800. For capturing high-quality videos, CMOS sensor is the key. And the sensor in this camera will make you have videos of 1920 X 1080 resolutions. What if using a camera was as simple as using your smartphone? It’s not a dream anymore! The Canon Vixia hf r800 has a wide touch panel with LCD display. Not only this makes navigation easier it also helps to jump to all options quicker. So this is a good time saver. Overall, the Canon Vixia hf r800 manual provides you the complete package you need, in order to capture every moment you enjoy. Question: Can it allow a microphone externally? Answer: Yes! It allows an external microphone. Question: Can I do videography with night vision? Answer: No, there is no option for night vision but there is a mode called night mode. Question: Is there any option for live streaming? Answer: Yes. It is a new feature with this camera. Question: Is the focus manual or auto? Answer: Fortunately you can use both types of focus if you want. Question: Can I level the volume? Answer: You can set the volume level for capturing, and you can rise up or down the volume while viewing the videos as well. Videography requires a lot of tasks to do. These tasks can get more and more complicated without a proper device. The canon Vixia hf r800 is made to give priority to your comfort. 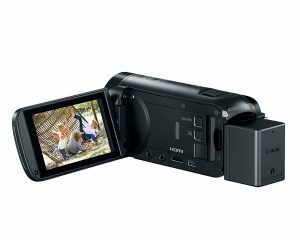 As you can see in this canon vixia hf r800 camcorder (black) review this device provides such amazing features that will fulfill your requirement. Also, this device can make your videography experience a lot better with its capabilities. So, I am sure that this canon vixia hf r800 camcorder review helped you to get all the information you needed. And finally, I hope you will consider this device when you think about getting a video camera.